This particular kadigan is a funky, versatile jacket that I designed for the Knitting Goddess – you can see it on Joy's stall at Edinburgh this weekend, if you're lucky enough to be going. I'm super excited about this release. The construction is a bit quirky and, honestly, I was pretty nervous about it. I made a little doll-size mock-up but couldn't be sure it would work on an actual adult human body until it was actually knit. And there was quite a bit of ripping along the way, as I worked certain aspects out on the needles. But it did indeed work and I love it so much! The quarter-circle fronts lend themselves to being worn three different ways – closed, buttoned back military-style, or hanging free in gorgeously rippling folds (probably my favourite). You get a fancy back detail, because the going-away view is important too. And – I'm really very proud of this – you get a perfect neat edge where the two sections are joined. So satisfying. And it's just plain fun to knit, as well as fun to wear. Ridiculously fun. I put that down partly to garter stitch short rows (so fun, and if you're not a great short row fan, is that maybe just because you haven't tried the German method yet? I have a tutorial!) and partly to the self-driving nature of the construction. Most of the time you're ploughing along without having to check the pattern, and yet, it's not boring. You're doing stuff. It's just that you're following the logic of it, not the numbers. I freaking love that. I could knit this jacket a hundred times. It's also beautifully adaptable, so you can get a perfect fit for your body without pulling out the calculator. Slim arms and big bust? No problem! Want it longer or shorter? Ok! 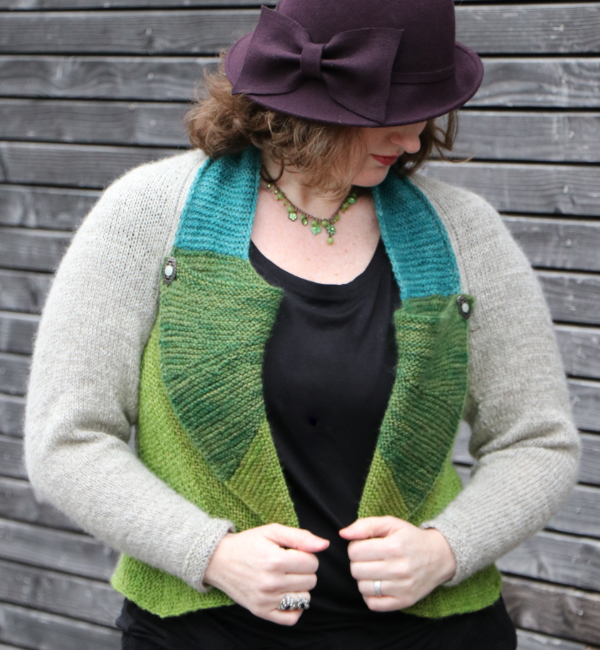 I specifically wrote it to encourage knitters to choose their size for different elements (sleeves, cross-bust width, and back length) independently – and you can try it on as you go, tweaking when needed. Yes, yes I am already thinking of making another, can you tell?! Elfling has also asked for one of her own, and I have yarn left over – so there's an excellent chance you'll see a junior version of this later. 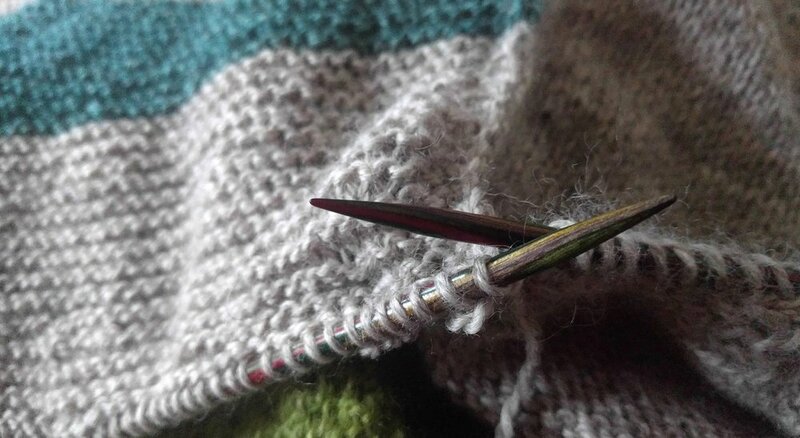 PS: I have to tell you, I spent a lot of time ripping this jacket out and reknitting it – par for the course when you're trying something new – and the amazing British wool held up to this abuse so very well. It got a little fuzzy (well, fuzzier) in the most-handled parts, but there was no pilling or general sadness. And the whole time, it felt so unbelievably delicious in my hands, so soft and sheepy… even after knitting the whole thing close to three times, I was still sad to be done with the knitting. Admittedly I tend to fall in love with every yarn I knit with, but this one more than most. I could cuddle it forever.